Motorists are set to be hit with larger speeding fines from April. Currently, the maximum fine you can receive is capped at £1000 increasing to £2500 if you are caught speeding on the motorway. 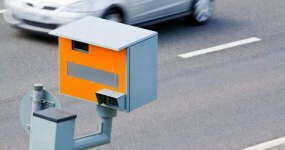 However, the new rules could see the most serious speeding offenders paying up 150% of their weekly earnings. The new fines will be grouped into 3 categories: A, B & C. Which band you're in will depend entirely on how much over the speed limit you are and the fines to go alongside them are seeing a hefty increase. For example, if you are driving in a 30mph zone and are caught doing 31-40mph, you will be grouped into Band A (the least severe) and can receive 3 points and be fined 50% of your weekly income. Should you be travelling between 41-50mph, you will be classed in Group B meaning you could face 4-6 points on your licence, a disqualification for between 7-28 days and a fine of 100% of your weekly income. Band C would be anything over 50mph and is the most severe: this means you could face 6 points on your licence, a disqualification from driving for between 7-56 days and a hefty 150% of your weekly income in fines. For those who have not been caught speeding previously will still be given the chance to attend a Speed Awareness Course. These new fines will come into affect from 24th April 2017.